Are you thinking about buying an Android smartphone...but want to try out the phone's apps first? Or do you already have an Android phone and now want to run your favorite apps on a larger PC monitor. BlueStacks App Player, now in alpha, lets you do both of those things on a Windows PC. 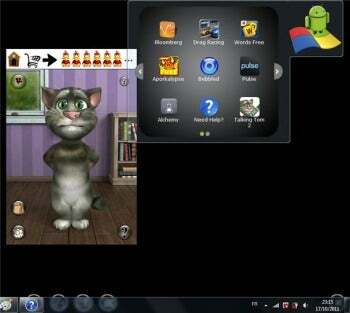 BlueStacks App Player runs Android applications such as Talking Tom 2 within Windows. Once you've downloaded the app onto a PC, an icon of the Android robot standing on the Windows logo will appear on the top right-hand corner of the Windows desktop screen. When you position the cursor on the Android icon, a menu of more than 10 default apps appears; you can open any of these apps with one click. You can also use your system's mouse and keyboard to interact with the Android apps on your PC. Pulse, Talking Tom Cat 2, and Drag Racing are among the apps available. Testing them on an Acer Aspire 5738 laptop with a 2.1GHz Pentium Dual Core CPU and 8GB of memory running Windows 7, I didn't run into any of the bugs you might expect to encounter in an alpha version of software. To exit any Android app, simply click the X icon on the bottom left-hand corner of the screen. To open a Windows program running in the background, without closing BlueStacks App Player, press the keyboard's Alt and Tab keys. BlueStacks App Player runs the same way as any other application on Windows. You access BlueStacks and the apps running on it just as you would an Internet browser, word processor, or other Windows app, without slowing down your computer. The BlueStacks App Player runs applications from a different operating system on Windows without requiring you to install a separate operating system or console. And since the player runs on Windows, you don't have to boot into another OS to run the apps on your PC. To add an app to BlueStacks App Player, click the BlueStacks Channels icon. There, you'll find listings for dozens of other Android apps, which you can download with your Web browser by clicking the app icon. BlueStacks also offers Cloud Connect, for transferring apps from an Android phone to a PC or tablet. To accomplish this, you must first install BlueStacks on your Android phone and then upload apps to the cloud version of BlueStacks Cloud Connect for download to your PC or tablet. Though the feature isn't available in the alpha version, the final version of BlueStacks App Player will let you download apps from the Android Store. BlueStacks App Player requires Windows 7 or Vista, at least 2GB memory, and an Intel Core 2 Duo or more-powerful processor. I would have preferred compatibility with Windows XP and Linux as well. BlueStacks will launch a final version of BlueStacks App Player Pro soon, for a yet-to-be announced price. The company promises that a free version will remain available, however. For those users with PCs or tablets that meet the Windows operating system and hardware requirements, and who want to run Android apps on their PCs, BlueStacks App Player is well worth the free download. Run Android apps on your Windows PC with BlueStacks Player App.